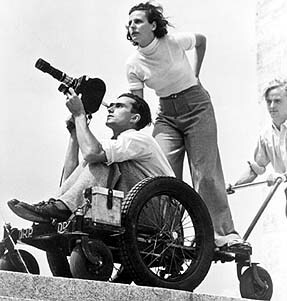 MUNICH -- At the age of 98, controversial filmmaker and photographer Leni Riefenstahl is still going strong. Call it a triumph of the will. After surviving a helicopter crash in Africa earlier this year, she spent two weeks scuba diving in the Maldives in August. Now she has developed an interest in the Internet, and is setting up a home page. "I have so many plans and projects that I'd like to do I could live another 100 years," she said in a rare interview. Rocketed to worldwide fame in the 1930s as Adolf Hitler's favourite filmmaker, Riefenstahl has not made a feature film in half a century because of her links to that era -- a blacklisting she has long said was unfair. "There were so many attacks against me. The main accusation was that I made the film Triumph of the Will," she said, referring to her documentary of the 1934 Nazi rally in Nuremberg. Critics said the film helped create the myth of the all-powerful Hitler -- exactly what the dictator wanted. "But it was a documentary film after all. I was commissioned to do it and had to make this film. And I made it without any commentary. I didn't make it as a political movie, but more as an artwork. That was my misfortune." Her 1938 film Olympia, a documentary on the 1936 Berlin Olympic Games, helped cement her reputation as one of the most innovative German filmmakers. Postwar efforts to revive her film career met continued setbacks, and finally she switched her focus to photography, especially of the Nuba tribe in the Sudan, and to underwater photography. Only in the past few years does she sense that public sentiment has changed. "In the last two or three years I have had a very good press and great success," she said, referring to showings of her work in Germany. Her name is in the news again following the publication of a retrospective book, Five Lives,highlighting her careers as dancer, actress -- her first film was in 1926 -- director, photographer and diver. Riefenstahl may yet receive another burst of publicity if Hollywood star Jodie Foster succeeds in making a film on her life. "I'm not sure that she can make what she wants to make. She wants to make a very fair film. . . . I have met her, we have spoken together, and she wants it. But it is very difficult," Riefenstahl said. The reason, she said, is that some powerful people in Hollywood still dislike her and may attempt to block funding. Riefenstahl's remarkable energy nearly led to her demise in February, when she returned after 23 years to Sudan to revisit the Nuba tribes she had photographed starting in 1956. "We flew back with a Russian helicopter from the Nuba to Khartoum, and in a midway stop the helicopter crashed," she recalled. "We had the great luck that none of us were killed, but were only injured. The cameraman was very severely wounded. He lost his eye and is still not healed today. I had broken ribs which went into my lungs and I had to stay four weeks in a clinic." Even that experience did not temper her lust for adventure, and in August she set off for the Maldives, the Indian Ocean setting of some of the world's most spectacular underwater scenery. After three operations in the past year, she said diving wipes away the physical pain she often feels on land. Asked to describe her greatest surprise, Riefenstahl spoke about her notorious patron. "The most deeply upsetting thing that I have experienced was the terrible things that Hitler did," she said. ". . . When we were living then, we had no idea, we did not know what terrible things would happen." Yet it was Riefenstahl who originally sought out Hitler, in 1932. 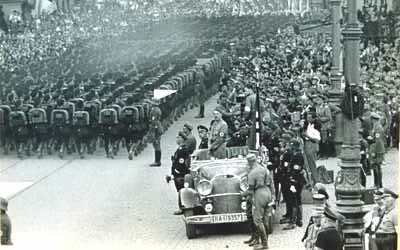 "Back then, Hitler had such a charisma that everyone wanted to see him. I was just curious," she recalled. "I wanted to make a judgment in person." Today Riefenstahl lives in a small village an hour's drive south of Munich. Age has slowed her somewhat in recent months. Following her operations, she must visit the hospital daily for treatment. But she is confident she will recover to take on her next project -- a movie highlighting her underwater filming of the past two decades.